In just a few minutes you can create a list of support strategies tailored to your personal conflict style preferences. These are things that other people around you could do that would help you be at your best when disagreements arise. Why might you want to create such a page? Creating a MySupport page is an exercise in self-knowledge about what helps you function well. Just as important, it is taking healthy responsibility for self, because it positions you to take constructive steps towards creating the environment that you need to function well. For example, if you favor the Avoiding style and know that you function better if you've first had a chance to quietly reflect on things before negotiating with someone, you will be able to say, in a positive and constructive way, "I will be a better partner in this conversation if I have some time to think about the issues before we plunge into things. Could we plan to meet tomorrow afternoon so I have time to do that?" People who care for you will be pleased to have specific suggestions about what to do - or not to do - that will be helpful for you. Typically people don't have a clear sense of what is helpful to others and they welcome ideas, especially those that you yourself have created. Sharing a list of styles-based suggestions with others is an excellent, non-threatening way to begin a conversation about managing differences more effectively. They may be motivated to also take the inventory and then you can make it a two-way exchange. There you can edit it. Start with the style in which you scored the highest (drawing from either Calm or Storm). First delete suggestions for that style that you don't like. Then edit the remaining suggestions: change words or phases to make each suggestion right for you. Continue on to the style in which you scored the next highest and repeat. Feel free to edit and draw suggestions from any style, but you will probably find that most of the ideas that "work" for you come from the styles in which you scored the highest. Then delete everything from the page you don't want to keep, including, probably, these instructions. You may want to finish by re-ordering the ideas with the most important ones at the top. Note: You will not be submitting anything to our website as you do this. You simply take information from the website and then edit it on your own computer and print out to make this page. -Move towards me, not away from me. -Talk with me, don't go silent. -If there's a problem, I want to sort it out as soon as possible. Delaying a discussion for no good reason upsets me! -If you need space to cool down or think about things, I can handle this if you indicate this to me, and at the same time suggest specifically when you will be ready to talk about things (e.g., in an hour, or tomorrow at nine o'clock, etc). -I am often very task-focused but I care more about relationships than I sometimes let on. -If you remind me to give more attention to the relationship, I'm likely to appreciate the request and try to honor it. -I am more likely to notice and respond positively to your needs if you approach me when I'm not in the middle of a task. -Don't just tell me you have a problem; let me know you want to work with me to solve it. -If you can, tell me what you want rather than dwelling on what you don't want. -I appreciate being given information: about your intentions, options for resolution, data, etc. I respond positively to a sense that you're genuinely trying to help me get all the information needed to see what is going on. -Giving me time and space to think things through almost always helps me to feel you're trying to be reasonable. -You will probably get more of what you want if you use a "two-step approach" with me. Step One: Tell me what you want to talk about and suggest a time to talk; Step Two: Only then, at the agreed time, have the discussion. Or: Step One: make a request and ask me to think about it. Step Two: Come back later to get my response. -Speed and pressure frustrate me. -It's easier for me to be positive if you stay low-key; as in keeping the volume and pressure down. -I am more likely to say yes to something if I have information about it and time to examine the info. The more data about precedents, possibilities, rules and regulations, cost, benefits, etc., I have, the better. -I don't want either of us to lose; I want both of us to win. I'm at my best when we work together to try to accomplish that. -I'm ready to put time and effort into dialogue on things I care about and I appreciate it when others are ready to do so as well. -It's important to me to talk things through and know all sides have been heard, not just have a shouting match. -I don't expect quick resolution of difficult matters. I'm prepared to go through a phase of intense discussion or disagreement. What matters to me most is the tone of things. I appreciate people who can strongly disagree in ways that are respectful. -I'm uncomfortable when people go along with me "just to be nice". I'd rather know exactly what you're thinking, in a respectful way of course. -I really appreciate a good listener. -You can be direct and candid about what you want with me, so long as you are respectful. -Taking responsibility for mistakes impresses me. I can overlook a lot so long as you circle back and make it right, but the sooner you do this, the less damage there will be. -I hear criticism more easily if you present it as information about things you want or need rather than making demands. -I like having a plan for a difficult conversation. For example, we could agree at the beginning of a conversation that: 1) We'll start by giving each of us a chance to say what we're unhappy about. 2) Then we'll make a list of what our main differences are. 3) Then we'll make a list of things we agree on or appreciate about each other. 4) Then we'll look at each of our differences in turn. -I can be pretty intense about things. Please don't just disappear or walk out. If you need a break, it works fine for me if you explain what you need and tell me when you'll be back and ready to talk again. -Being fair, realistic, moderate and reasonable is important to me. 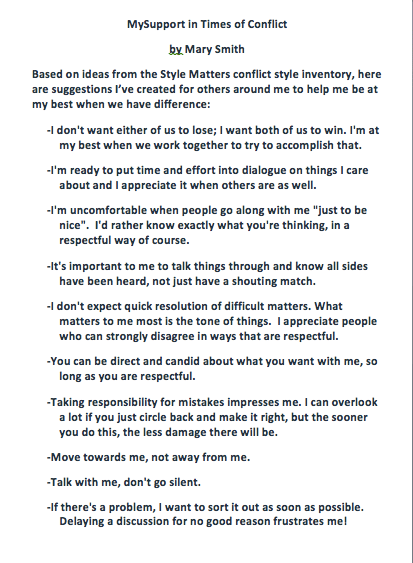 I appreciate it when others notice these values in me or bring them into a conversation about differences. -If you back off a bit from your position or request, I'm likely to do the same. -Take a "two-step approach" with me: 1) Say honestly what your first-choice solution would be; 2) Then without a lot of delay make an offer somewhere between your first choice and my first choice. -Don't drag the discussion on and on. Let's say what we want, find a compromise we can both live with, and then and get on with things. -Talking about things in a way that is not angry or hostile is an important goal for me. -I tune out of conversations that are long, heavy, and intense. Keep it "light". Have a sense of humor, express appreciation, be positive. -For me, relationships always come before people. You'll probably get more of whatever you want from me if you use a two-step approach: 1) Begin on a light note and chat about non-serious things for a few minutes; 2) Only then settle down to serious discussion. -I appreciate small gestures of friendship: a kind note, a compliment, bring me a cup of coffee, a thoughtfully chosen gift, a card, acknowledgement of work I've done, etc. -Since I value relationships and hate offending anyone, it's easier for me to speak my mind if you assure me you really want to know what I think. -I handle long discussions better if we take regular breaks and "lighten up" from time to time. -I respect task-focused people who know how to notice and appreciate the human beings around them as they work.